Essentially auto-generating a PowerPoint presentation using the Ideas tool seems like a powerful addition to your workflow. Smarter searches don’t necessarily need to live in a search engine. This week, Microsoft will debut two tools that will live in Office: Microsoft Search and Ideas, designed to assist workers trying to dig out the document that they need, now. Microsoft hosts its Microsoft Ignite conference this week, and the company promises literally dozens of announcements—most pertaining to its Azure cloud and related services. But Microsoft also plans a few key developments at the user level, including final rollouts of features the company has announced previously, such as the ability to blur backgrounds within Microsoft Teams video chats and transcribe meetings. The two most significant announcements for Office users are probably the enhanced Microsoft Search experience, which will traverse Windows, Office.com, Office apps, SharePoint, OneDrive, and more; and Ideas, a sort of rebranding of the intelligent capabilities already within some Office apps. 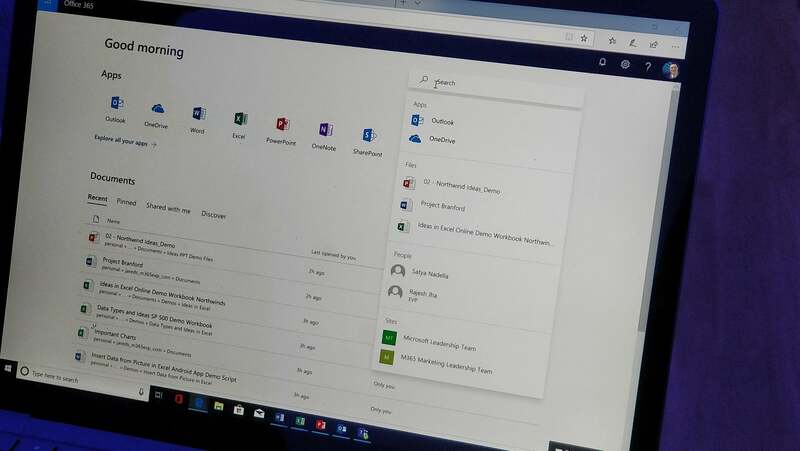 Microsoft Search is rolling out to the Office.com apps and Bing.com in preview, while Ideas will be added to Excel today, Microsoft said. 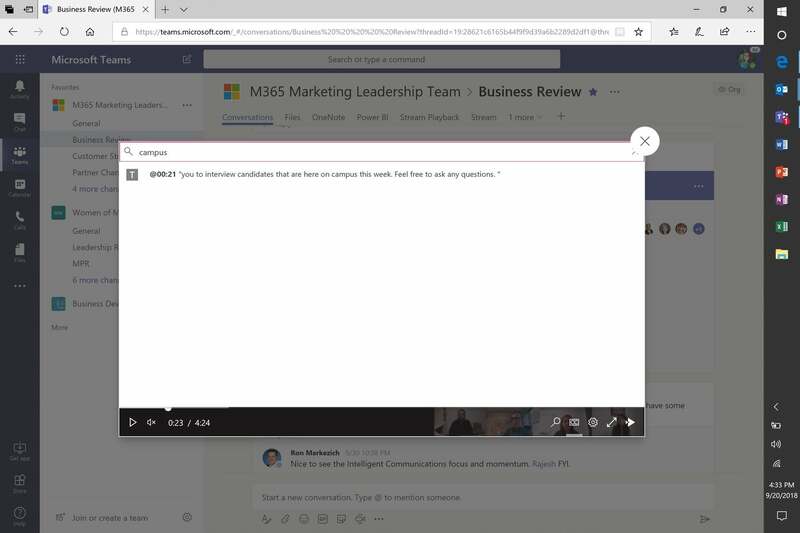 Microsoft Teams can now transcribe meetings as they occur, generating searchable archives. Microsoft has prioritized using AI to make its users' lives simpler, though it’s unclear how many users have ever tried the features. One example might be Microsoft’s Delve app, which intelligently surfaces documents that other members of your organization have shared using the Microsoft Graph. That capability now also appears in Microsoft Search, a dedicated search bar within various Office apps and sites. On the Office.com homepage, the new Microsoft Search bar displays a range of information, even before you begin typing. The Microsoft Search functionality will also appear within Microsoft Word, too. 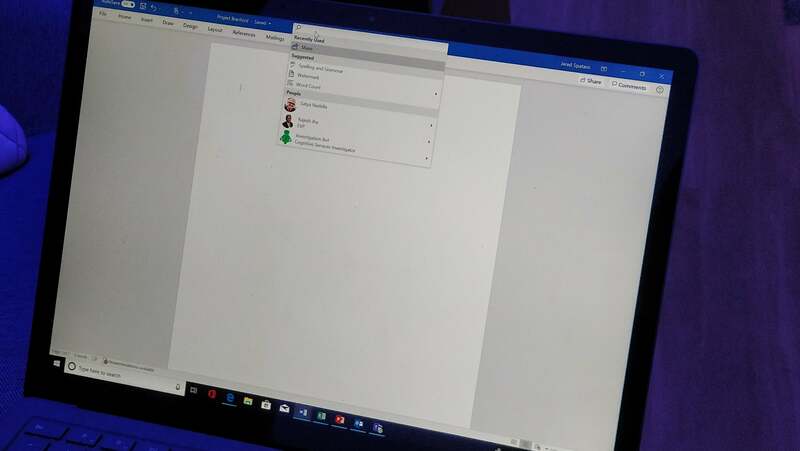 Office apps like Word already have a search bar of sorts: the “Tell me what you want to do” bar that simplifies trying to find specific functions within Microsoft’s Office ribbon. The Microsoft Search bar will replace it, Spataro said, and add context-specific actions to the list of things that a user might be searching for. Spataro also showed off a toggle switch that will consolidate the Office ribbon to a single, simplified ribbon. Here’s what Microsoft Search looks like in Bing. If you’ve ever used PowerPoint (and subscribe to Office 365), you may have seen a small icon to the right of the ribbon: Design ideas, also known as PowerPoint Designer. In a way, PowerPoint Designer improves upon the stylistic choices of an app like Sway, which allows you to randomly remix the stylistic elements of your illustrated narrative. PowerPoint Designer makes more intelligent choices based upon the content of your slides. Ideas begins suggesting themes for your PowerPoint slides after entering just the text—a terrific way for you to focus on the content, and let PowerPoint handle the presentation. Now, “Design ideas” becomes just Ideas, as represented by a lightning-bolt icon to the right-hand side of the Office ribbon. And they don’t just live within PowerPoint, as Ideas now appear within Excel and presumably Word as well. Ideas will apparently re-brand certain other features. In Word, for example, Office Insights taps Bing for more context on a given word. In Excel, Insights tries to find interesting aspects to your data—now Ideas will as well. In each, Office tries to go back to Microsoft’s online services to intelligently provide context. 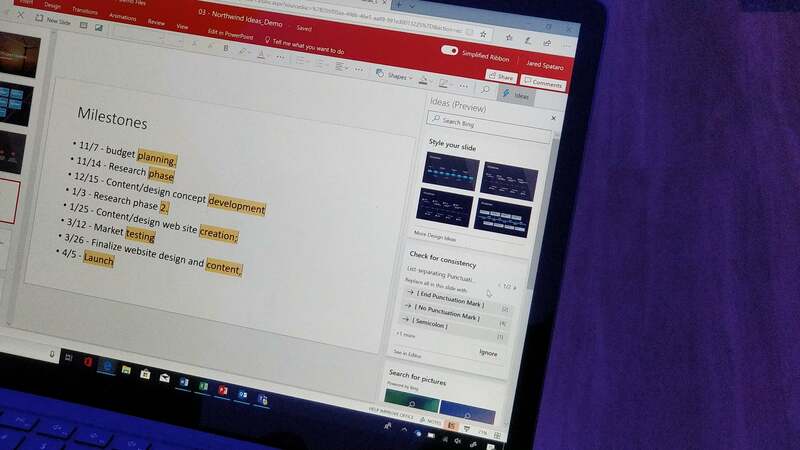 PowerPoint’s implementation of Ideas might be one of the most impressive, according to a demonstration by Spataro. Basically, after simply adding text to a slide, Ideas creates backgrounds and themes for the slides but also custom icons. “AI really gives you the opportunity to really give you power and simplicity,” Spataro said. Within Excel, Ideas usess AI to look for interesting relationships between your data. Note the “lightning bolt” Ideas icon in the upper right. Office is also adding smaller features. Place words like “Idaho” are now geographic data types, meaning that an app like Excel now “knows” that the word represents a state, a location on a map, and associated data like population. 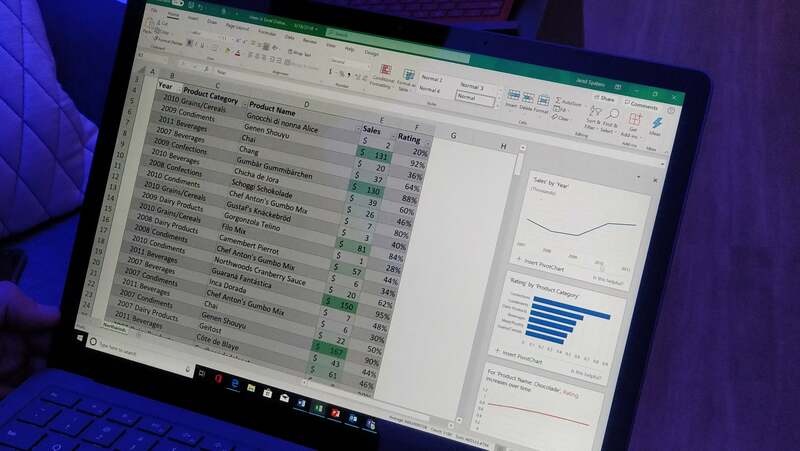 In a feature that appears to be a version of Office Lens, the mobile Excel app can now scan hand-drawn spreadsheets and convert them into editable documents. Finally, Microsoft is integrating your Outlook contacts and LinkedIn network, so you’ll be able to collaborate between the two groups of people and see LinkedIn “insights” into the people you’re scheduled to meet with. Look for the latter to roll out in a staged deployment soon, Microsoft said. Though Microsoft is pitching its security enhancements at enterprises, one aspect should be familiar: Microsoft is declaring an “end to passwords” by tying many of its Azure Active Directory apps to the Microsoft Authenticator, a two-factor app for Android or iOS that uses either a verification code sent to the app itself, or the manual entry of an 8-digit passcode that the app generates. The Authenticator app already works as a two-factor authentication solution for a Microsoft account. Microsoft will also assign companies a “secure score” for how they secure their businesses. 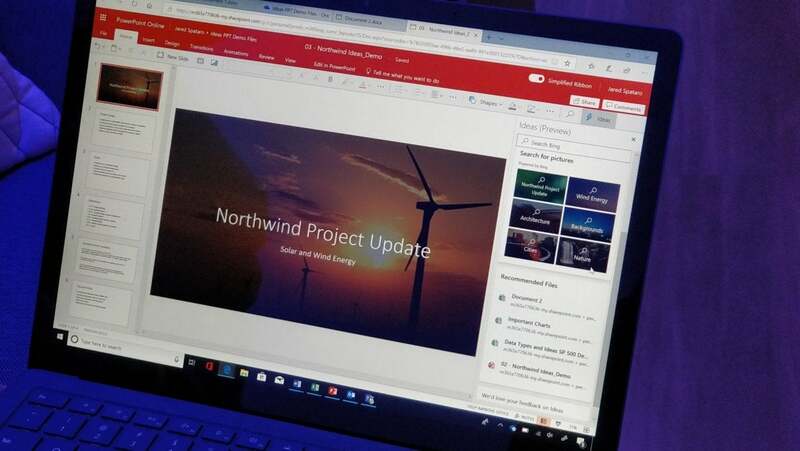 Microsoft plans to announce Windows Virtual Desktop, characterized as the only cloud-based service that delivers a multi-user Windows 10 experience, is optimized for Office 365 ProPlus, and includes free Windows 7 Extended Security Updates. It runs on top of Microsoft Azure. Surprise! There will be two versions of the Surface Hub 2. In device news, Microsoft said that its Azure Sphere security package for IoT devices is now in public preview. 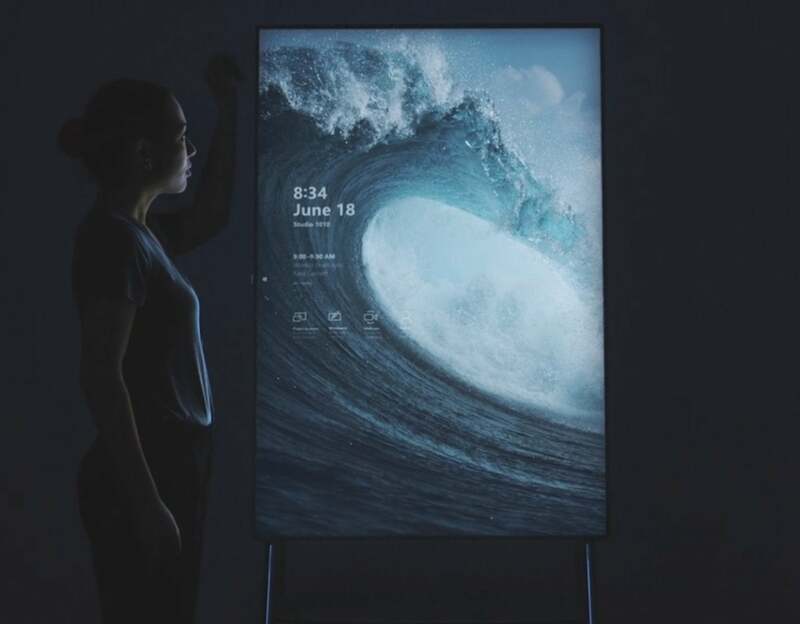 Finally, in a surprise move, the huge Surface Hub 2 collaborative display will be released as part of two “experiences,” or two versions, with different features and ship dates.